Harbourfront: DJs, free skating lessons, and an exhibition of artists doing ice carving -- and they say they'll have their campfires going. 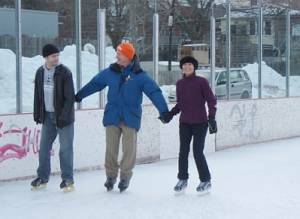 Regent Rink: A Family Day skating event is planned for the rink on Monday Feb.19, 2018, more news to follow. There are many partners involved here: Artscape, Daniels Corp., CRC, the Daniels Spectrum CSI, Dixon Hall, Parks and Recreation, MLSE, TCHC, and Hockey 4 Youth. Campbell Rink, Wallace Rink, and Dufferin Rink. Sounds like staff are being assigned to do a Caribbean-themed Family Day event at all three Ward 18 rinks (Dufferin, Wallace, Campbell) -- no posters yet. Campbell Rink: Despite the warm sunny days,this rink has been holding up well. 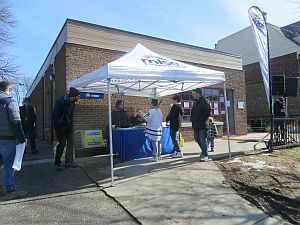 There were postings citywide about an MLSE event here on Family Day, somehow connected with MLSE skate equipment donations (see note below) for all three Ward 18 rinks. 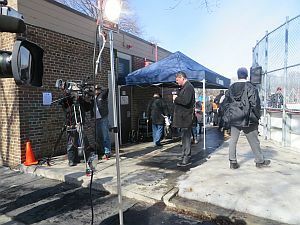 And indeed, today there was lots of hubbub at the rink -- music, tents set up, media, Darryl Sittler there to autograph free Toronto Maple Leafs shirts and toy hockey sticks. Note re the donation: The MLSE skate equipment donation is a bit of a mystery. The city councillor said she didn't really know the details; the Partnership office said they had worked on the lists of equipment needed, but it was unclear when. The rec supervisor said he has some boxes of skates in his office, that may have been there for a while already. Rink staff say they got new helmets a few weeks ago, but not skates. Dufferin Rink staff got 8 pairs of new skates to replace 8 pairs that disappeared over two weeks in early February. New helmets seems to have arrived earlier in the winter. Nobody is sure of the story, but one thing that seems clear is that there was no donation particularly linked to this event. The rink staff only heard about it a week ago, after asking their supervisor. Certainly this event was in no way local. 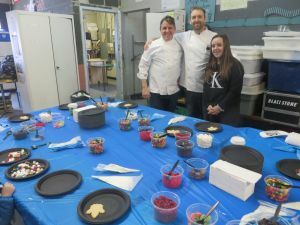 Christie Rink: First-ever "Family Day" holiday. Lots of grumbling in the papers that most people wouldn't even be able to take the day off. But they sure did, at least the rinks were full. Olivia Chow, the M.P. for this area, sent out posters announcing a Family Day skating party. The rink staff got in touch with her office and asked if they could help. That worked out well -- there was a campfire with free hot chocolate and hot dogs and marshmallows to toast, there were mini-pizzas and cookies, there was music and there were skates to rent. The day was very cloudy until the start of the skating party (2pm) and then the sun came out. It stayed partly sunny until the end of the skating party, about 4.15. All sorts of people came to the rink who hadn't been coming all winter. There was lots of talk about the poor condition of the rink, the scary youth who hang around there, the unsuitable rink staff. Sounds like there is a strong desire, locally, to make it work better next year. And there are lots of photos.